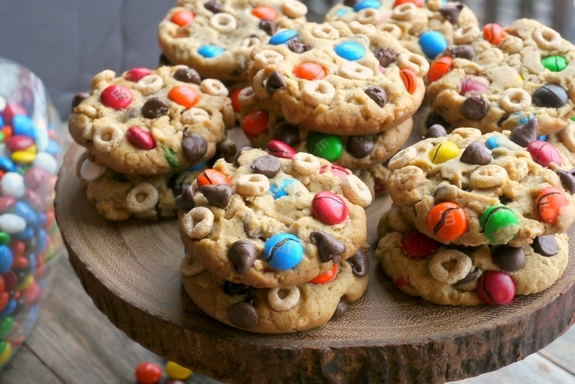 These Soft Baked Cheerio Monster Cookies are a delicious combination of peanut butter, oats, chocolate chips, Cheerios and M&M candy. They are perfection when it comes to texture with a soft cookie and all the crunchy additions. 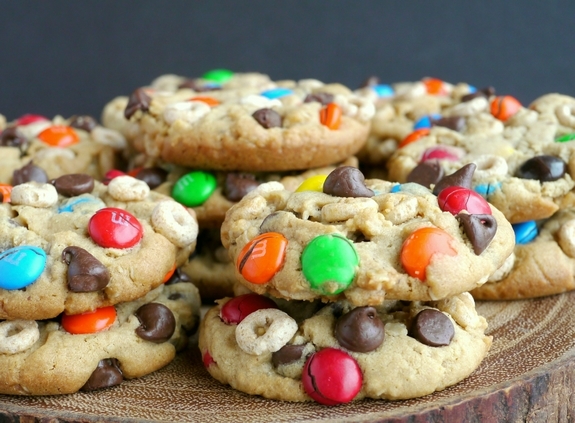 I have always loved Monster Cookies, mostly because I like M&M’s in my cookies…call me crazy, but I’m sure there are more than a few of you who agree with me. My biggest issue with Monster Cookies is that they can be a little tough with the amount of oatmeal used. I love a cookie that is a bit softer, but still has texture. This cookie and it’s ingredients takes care of all of that, not to mention they taste incredible. My son took these to a study group and the kids made ice cream sandwiches with them. What a great idea. As many of you know, I make MOST of my cookies in a Whoopie Pie Pan, like these Soft Baked Strawberry Shortcake Cookies as well as these Kit Kat Stuffed Soft Baked Cookies to name a few. Whoopie Pie Pans even make the best eggs. The picture above shows the cookies rolled into a ball after mixing all the ingredients together. I always weigh my cookie balls so they are the exact same size and cook evenly. It really makes a difference. The cookies above are still unbaked. I pushed the balls down slightly with the bottom of a glass and added more chocolate chips, Cheerios and M&M’s. By doing this your cookies stay beautiful on the outside and the ingredients are not just baked in the middle. 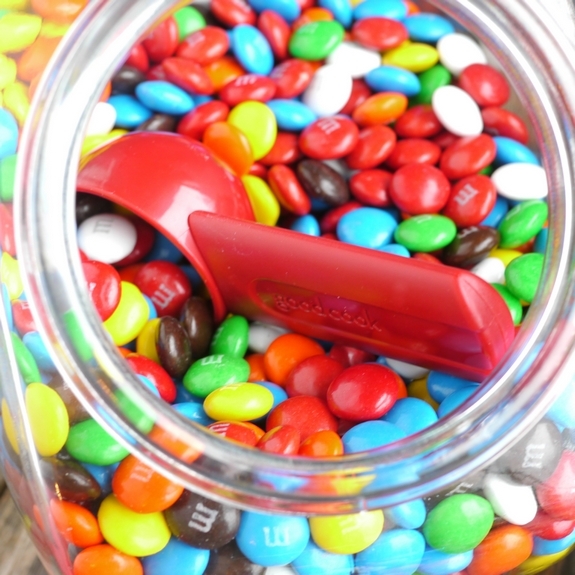 Everyone keeps a jar of M&M’s in their kitchen right? Thought so. Because the cookies are baked in a Whoopie Pie Pan, they are perfectly round and do not spread out onto the pan. Next time you put out a tray of these cookies, they are going to disappear quick. Consider making a double batch. Preheat oven to 350 degrees F. Spray Whoopie Pie Pan with nonstick spray. In the bowl of a stand mixer or with a hand held mixer, cream together butter, shortening and both sugars. Mix until light and fluffy, about 3-4 minutes. Add egg, peanut butter and vanilla until fully combined. Scrape down sides of bowl. Add flour and baking soda and mix together well. Add oats and chocolate chips too. Stir in M&M's and Cheerios. Form cookies into balls that weigh 36 grams or are about 2" in size. Place each cookie ball into the center of each Whoopie Pie well. Slightly flatten the cookie with the back of a glass. 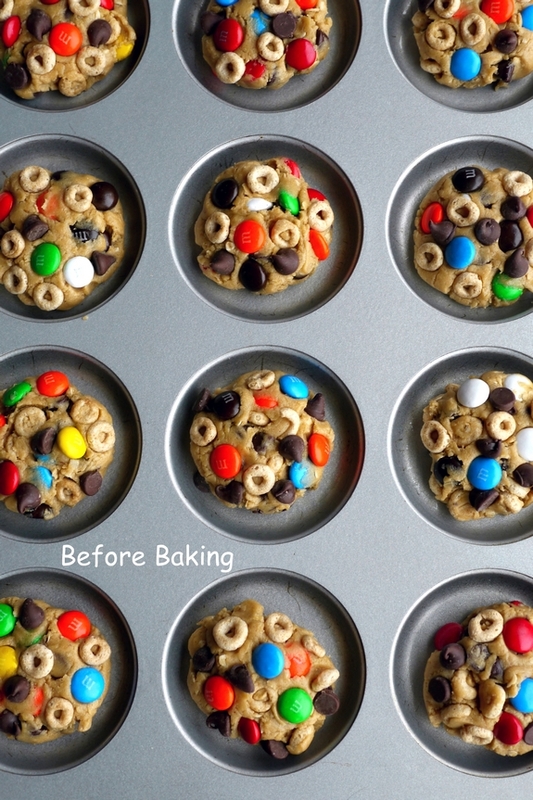 Add extra chocolate chips, M&M's and Cheerios to the outside of the cookie if you want them to look like the cookies in the picture. This looks so sweet Kathy! It seems very fun to prepare! The cheerio addition is so genius!! What a delicious cookie! I can honestly say I’ve never used CHEERIOS in cookies before, though, and I really look forward to giving these a shot. So fun! I have made monster cookies before, and my kiddos love them. Why have I never added cheerios?? These soft baked cheerio monster cookies are wonderful! My kids would go crazy over these! 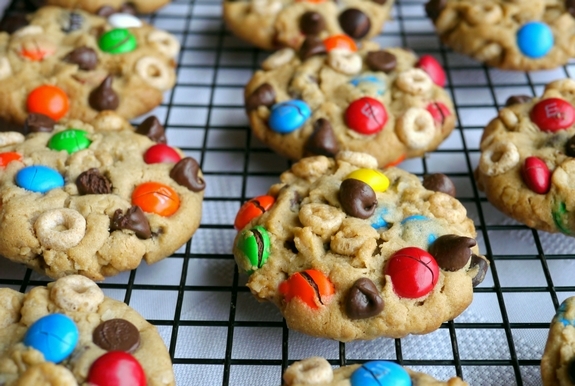 My kiddos love Cheerios so they will go crazy for these cookies! So fun! 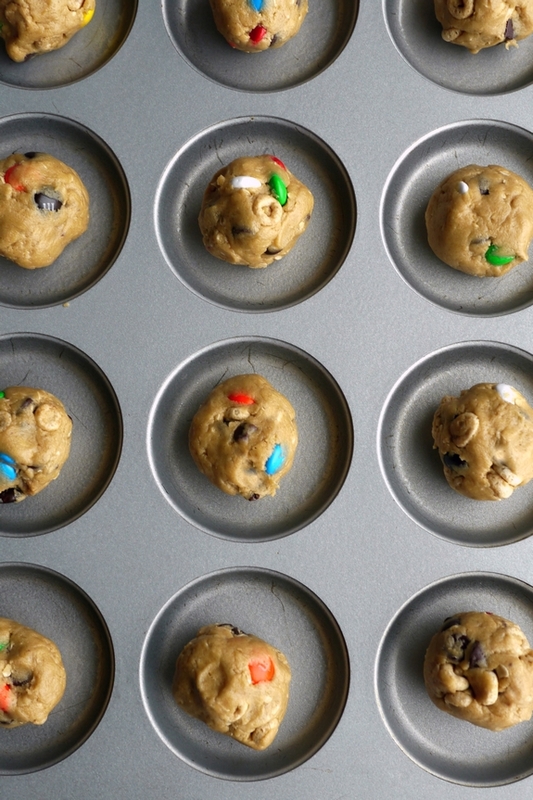 One, I’m going to add a bowl of M&Ms to my kitchen – two, I’m going to make these cookies! !